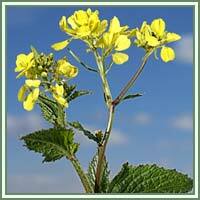 Habitat: Black mustard is native to the Mediterranean region. 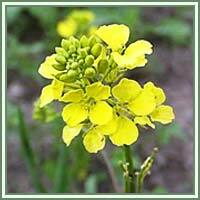 Description: Black mustard is an annual plant, grows up to 2 meters in height. It has a branching, angular stem with large, alternate leaves. The upper leaves are smaller and broadly elliptic,, the lower ones are broader, pinnately lobed and obovate. Yellow flowers are produced on the upper stems. The blooming period occurs during the summer, and lasts about 1-2 months. Medicinal use: Black mustard is an appetizer, digestive, diuretic, emetic, irritant and stimulant. Used internally, it can promote appetite. Grounded seed is applied externally to the skin in cases of rheumatism, sciatica, peritonitis, neuralgia, and numerous internal inflammations. It reduces skeletal and muscular pain. Herbal tea or grounded seed sprinkled on bath water is helpful in cases of fevers, colds and influenza. Safety: The seed contains substances that can irritate the skin and mucous membranes. It is advisable to consult your doctor/herbalist before consumption of Black mustard.